The X-Men universe has a long history of complicated, convoluted family relationships. Whether it’s the multitude of schemes surrounding Scott and Jean’s offspring, the issues between Charles Xavier and the Juggernaut or the origins of Wolverine’s long and troubled past, it seems they can’t go too long without delving into deeply personal matters. 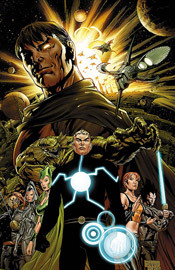 With X-Men: Emperor Vulcan, that trend continues as the story focuses primarily on Vulcan, younger brother to both Havok and Cyclops. Having unseated Shi’Ar empress Lilandra from her throne, Vulcan named himself her successor and now determines the fate of an entire alien culture. Even though it was spelled out on the first page, I never really felt the importance of the relationship between Havok, who appears in this story as the leader of the reformed Starjammers, and his younger brother. They never meet face to face in this first issue, but each spend time discussing one another and they never relate as siblings, only as rivals. Much of the reason these stories have worked for as long as they have is exactly that conflict of emotions, that struggle between love and hate, and when one isn’t a part of the picture it’s no longer unique. It just seems like business as usual, and an unnecessarily complicated business at that. A lot of what I didn’t like about Star Wars: Episode I when it was first released was the way the story traded in the youthful action that dominated the first trilogy for a much more political, slow-moving slant. Was the military action more interesting when Luke took out the Death Star in a desperate all-out attack, or when the Trade Federation formed a galactic blockade to slow economic relations between Naboo and the rest of the universe? Emperor Vulcan focuses on a tale more similar to the latter than the former, with an emphasis on wordy military strategy rather than action. The behind-the-scenes maneuverings are an important part of the story, no doubt about it, they’re just not an extremely interesting one. Accompanying Christopher Yost’s rather tame storytelling is Paco Diaz’s equally vanilla artwork. There’s nothing particularly wrong with the way he renders this tale, but there’s nothing exceptional about it either. He knows the characters, but he never gives them his own unique spin. Rather than playing a part in the storytelling, he’s merely documenting the event. He’s given a dozen chances to play with the extravagant decoration that surrounds the Shi’Ar culture, but treats it as such a mundane, lifeless environment that the action nearly grinds to a halt. He’s a bad match for the story Yost is trying to tell with this series. Combine this story with a stronger artist, or this artist with a better story, and their individual flaws may have been a bit easier to overlook. Together, though, they’re tough to forgive. I know the characters, I know the scenario, I know the backstory, but after half a dozen pages I was lost, overwhelmed by detail and bored. If you’re particularly taken by the constant evolution of the Shi’Ar people, you may want to give this a glance on a purely historical note. If you’re just looking for a good read, I’d skip this and continue your search.